This is in continuation to the blog on 3 chart types supported by OVP namely Line, Column and Stacked Column charts. For a complete list of chart types supported by OVP(as of version 1.60) please refer to the help documentation. Scatter plots help in plotting on both horizontal and a vertical axis to show impact or the co-relation that the x-axis and y-axis variables have on each other. 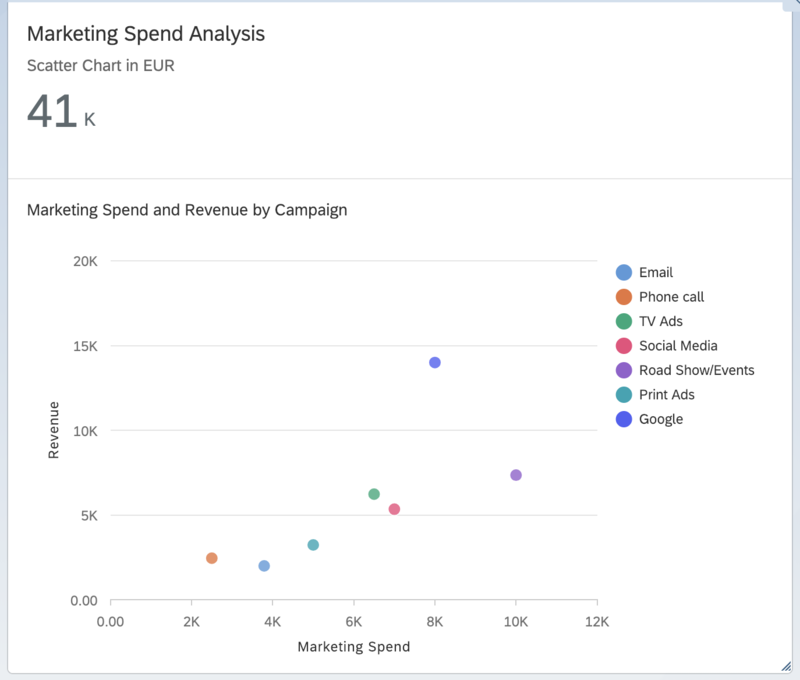 A relevant use case for scatter chart is for Marketing analysis, to study the impact of marketing spending on the revenue. Based on this the Marketing Analyst could then revise existing marketing methods or come up with newer ones. It plots exactly 2 measures and a minimum of 1 dimension. A scatter chart card supports a maximum of two dimensions. Note: if the dimension is not marked with any role, then all members of the dimension are plotted as same coloured equal sized bubbles in the chart. A maximum of one dimension can be marked with role “Series” and all members of such a dimension get a different colour. A maximum of one dimension can be marked with role “Category” and all members of such a dimension get a different shape. Bubble charts are often used to facilitate the understanding of social, economic, medical, and scientific relationships. A bubble chart is a variation of a scatter chart in which the data points are replaced with bubbles, and an additional dimension of the data is represented in the size of the bubbles. Just like a scatter chart, a bubble chart does not use a category axis — both horizontal and vertical axes are value axes. 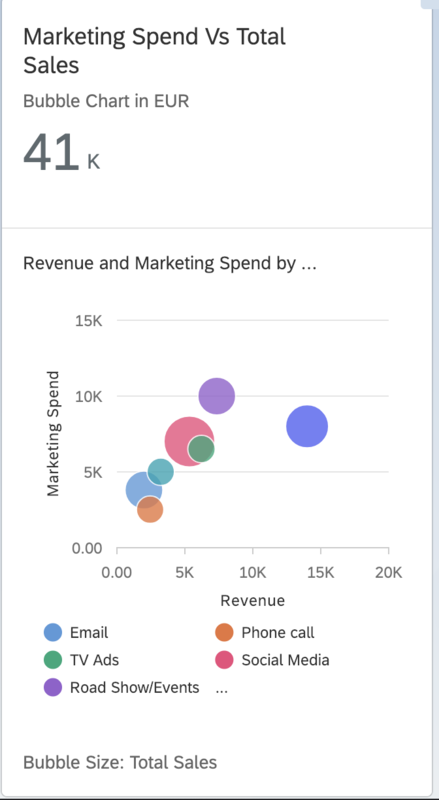 Bubble charts display up to three measures and two dimensions of data. The three measures are reflected in the X and Y axes, and in the size of the bubbles. The dimensions can be expressed in the colours and/or shapes of the bubbles. 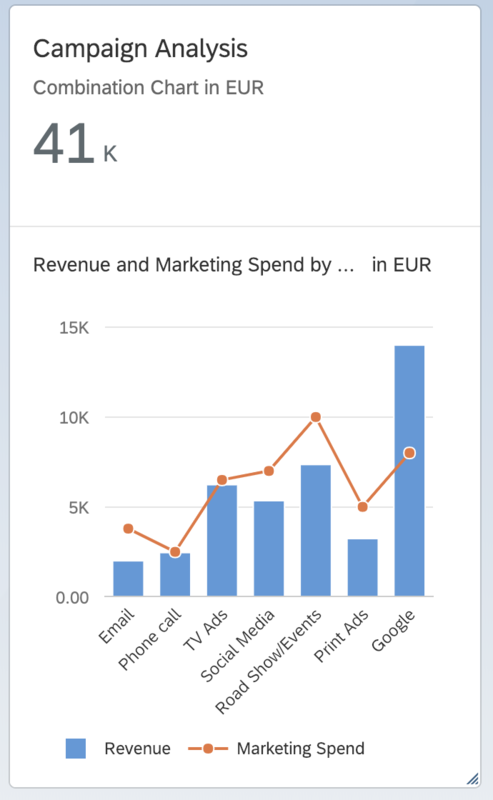 I have used the same use case as earlier to also plot the total sales in addition to marketing spend, revenue per campaign below. Bubble charts require three measures and at least one dimension, yet allow a maximum of two. The first measure for which the role is set to axis1 makes up the X axis. The first measure for which the role is set to axis2 makes up the Y axis. The remaining measure impacts the size of the bubble. The dimensions for which the role is set to series, result in different coloured data points in the chart. Note: If multiples dimensions are set with the category role, only the first dimension is considered. If both dimensions have been assigned the role series then each combination of the dimension member will get a unique colour. For example, if “Year” and “Country” are the dimensions and both have been assigned the role series then “India/2018”, “India/2019”, “Germany/2018”, “Germany/2019” will be represented as a different coloured bubbles. Note: If a dimension is not marked with any role, then the dimension members will get the same colour. In the above example, if year is not marked with any colour, then the bubbles will only have two colours – one for all records of India and one for all records of Germany, irrespective of the year. The dimensions for which the role is set to category result in different shaped data points in the chart. Note that if multiples dimensions are set with the category role, only the first dimension is considered. A combination chart is a chart that combines two or more chart types in a single chart. In this case it combines a Column and Line chart into one chart. A combination of bars and lines in the same visualisation can be useful when comparing values in different categories, since the combination gives a clear view of which category is higher or lower. The first measure gets displayed in a column format. 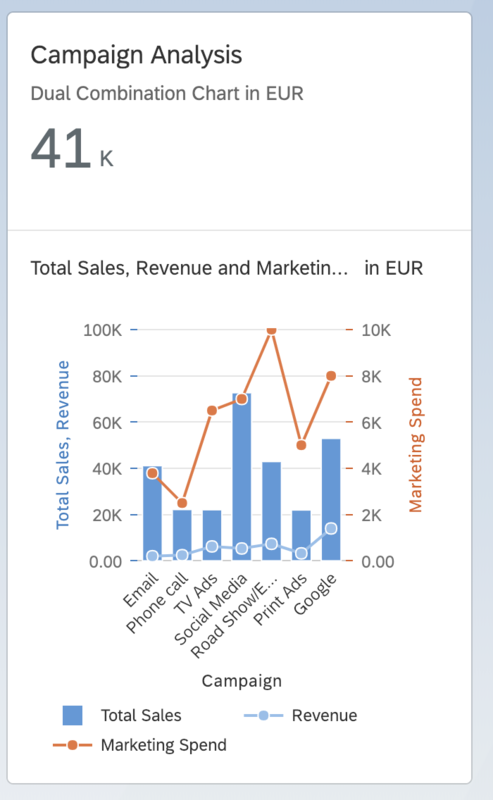 Subsequent measure is displayed as a line within the chart. It is recommended to have only one time-based dimension for the category axis in such charts. All measures, irrespective of their roles, get assigned to the feed UID value axis. There must be at least two measures for combination chart cards to work. All dimensions with role “Category” get assigned to the category axis. This is also the default role. There must be at least one role that can be assigned to the category axis. All dimensions with role “Series” get assigned to feed UID colour and get displayed within the chart area with different coloured column and line combination for each of its members. A dual combination chart card is a variation of the combination chart card. In case of multiple measures being configured by the user, the chart will adjust accordingly to accommodate 2 value axes, with the line chart coming into play for additional measures. This provides more clarity for individual data points, for a particular dimension. This can be used as an alternate if bubble sizes in bubble charts are not very clear. There must be at least two measures for dual combination chart cards to work. 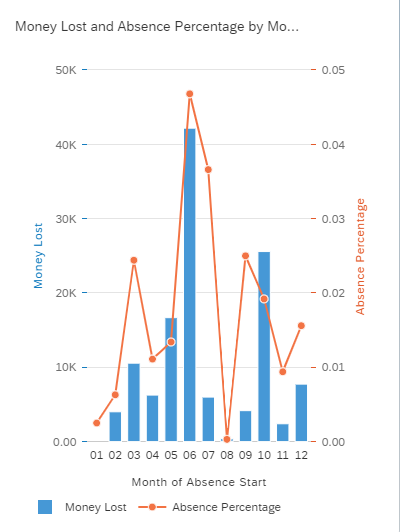 The first measure gets displayed in a column format, subsequent measures are displayed as a line within the chart. All measures, irrespective of their roles, get assigned to the feed UID value axis. All dimensions with role “Category” get assigned to the category axis. This is also the default role. There must be at least one role that can be assigned to the category axis. It is recommended to have only one time-based dimension for the category axis in such charts. Here is the link to the project where you can find all these chart cards. Thanks Prasita! I like how you have explained the purpose of each chart. I’ve included this blog in the Fiori elements wiki. I’ve been reading your blogs and working through some OVP examples myself but I am stuck on creating analytic cards. When creating the card there is no options listed for the value of “KPI Annotation Path”. I’m assuming that relates to either @UI.chart or @UI.dataPoint annotations in the CDS? If not what is the correct annotation? I am using Web IDE Full Stack, which is the latest version I guess. Still I am facing the option of “KPI Annotation Path” where there coming no option. Any suggestion? Please check if the KPI annotation is available in the local annotation file for the selected entitySet. If yes then is it should be available for selection in the web ide wizard as well. A very good article. I’ve got the Combination Chart to work in WebIde, and it works fine on the OVP page (in WebIde). 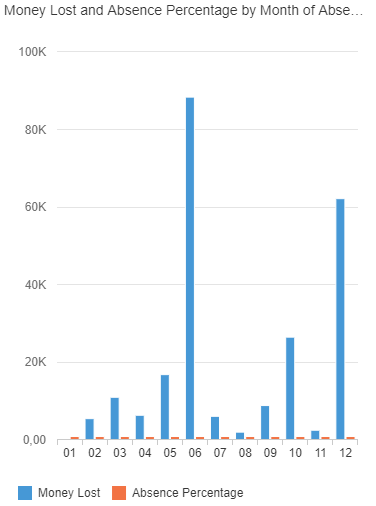 However, when I publish the OVP back to On-Premise the visualisation goes from this…. The version I have is 1.52, so i’m guessing the Dual Combination on OVP chart does not work on 1.52? I’m trying to get the Combination Dual to work in an Analytical List Page and am getting an error message ‘Target Was Not Found’. Any suggestions?